PITTSBURGH, PA – June 23, 2014 – Security industry leader Pam Petrow was named Entrepreneur of the Year at this year’s EY Entrepreneur of the Year Western Pennsylvania/West Virginia Program gala. Ms. Petrow is currently President and CEO of Vector Security. Recognized as one of the world’s most prestigious business awards, the Ernst and Young award honors distinguished entrepreneurs who demonstrate widespread success, a commitment to innovation and forward thinking and unwavering passion for business. Ms. Petrow leads a top 10 security company serving nearly 300,000 residential and business customers. Her management style challenges managers to learn what their direct reports do on a day-to-day basis and to adapt their management style to extract the best performance from their employees. This passion for customers and employees extends well beyond Vector Security’s walls. Pam has held leadership positions in a number of security industry associations and received a number of awards including the Public-Safety Communications Officials International President’s Award and Central Station Alarm Association recognition for her outstanding contributions to the electronic transmission of signals between central stations and 911 dispatch centers. 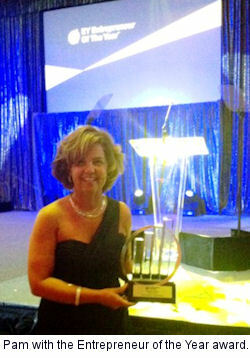 In 2012, Ms. Petrow was inducted into the Security Sales & Integration Hall of Fame.